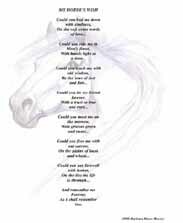 Welcome to DarkHorse Ranch, Inc., featuring the poetry prints of Barbara Anne Dunn. DarkHorse Ranch is named after Barbara's Peruvian Paso, "El Despejo". He embodies the beauty, spirit and friendship of the horse. Enjoy your visit to DarkHorse Ranch, Inc., and know that a percentage of your purchase of the poetry prints from this site will go to help support equine rescue, and to help those who help the horses. Political activities that enhance the welfare and protection of the horse. Using the arts and aesthetics, and the written word, to raise awareness and improve conditions. "May you hear the poetry in the echo of their hooves."